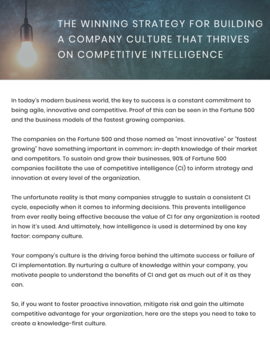 The companies on the Fortune 500 and those named as "most innovative" or "fastest growing" have something important in common: knowledge-driven corporate cultures. Over time, the most successful businesses have developed cultures that encourage knowledge sharing and facilitate the use of intelligence at every level to inform strategy and innovation. Learn how you can gain a competitive advantage by doing the same! Click here to access your download!